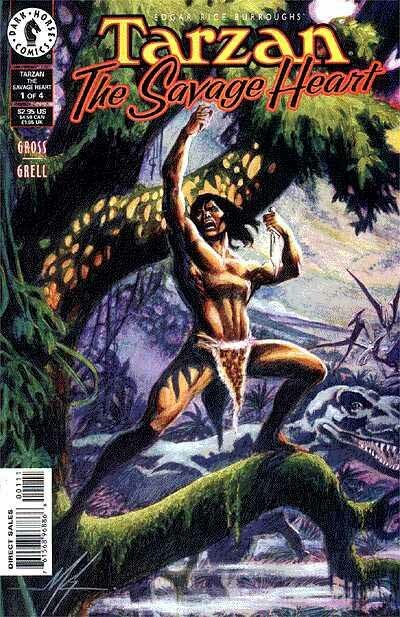 This and all covers and logos ©Edgar Rice Burroughs, Inc. 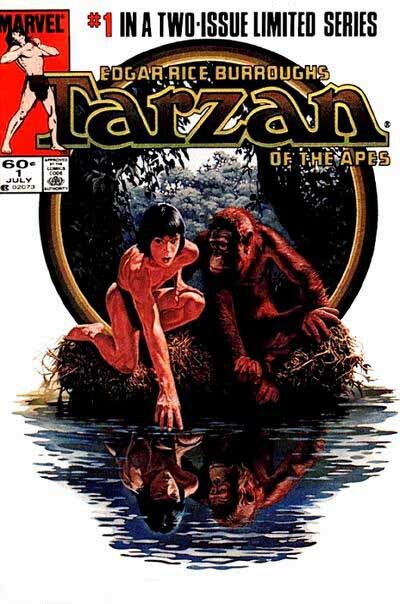 In 1977 the Tarzan license passed to Marvel, and they were the ones who broke the tradition of thirty-plus years by abandoning the consecutive issue numbers and beginning with a new issue 1. I can’t fault them for it. New Marvel readers were more likely to pick up a first issue than one numbered 259. At first glance the logo seems the same as the one DC began with, a taller version of the famous newspaper strip logo, but looking closely, there are some differences. The biggest one is in the ball of the R, which is smaller and rounder, but all the serifs are also narrower, and the places where the letters join are slightly different. My guess is someone on staff at Marvel traced off an early DC issue, then made minor changes that looked good to him. The effect is the same, though with all the Marvel trade dress, the overall look of the cover is quite different. Equally good art, though, I think by John Buscema. Marvel had the property for a few years and did well with it. In 1984 they also produced this movie tie-in with a logo again much closer in proportions to the newspaper strip logo. I have a feeling ERB, Inc. had decided this was the best known logo, and they’d stick with it. Not a bad choice. 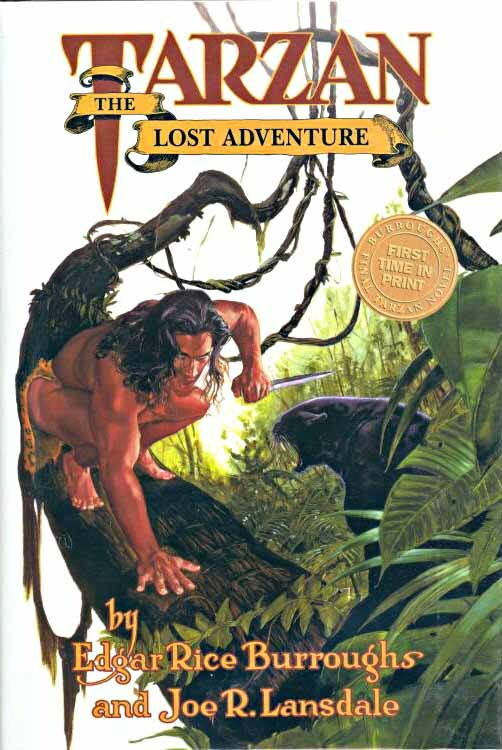 I can’t find any Tarzan comics published in the U.S for about ten years after that, but in 1995 the license was picked up by Dark Horse Comics. 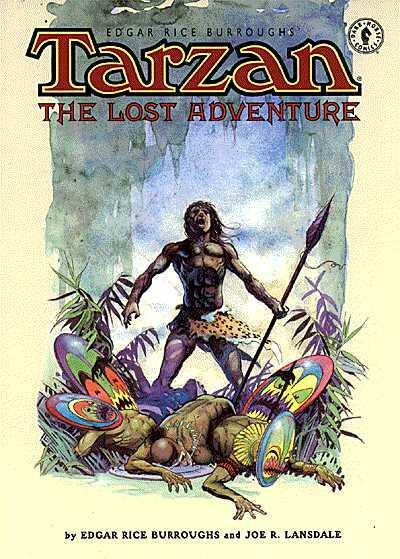 One of their first projects was this adaptation of an unfinished Tarzan novel by Burroughs completed by novelist Joe R. Lansdale. The comic had covers by Arthur Suydam and art by Charles Vess. 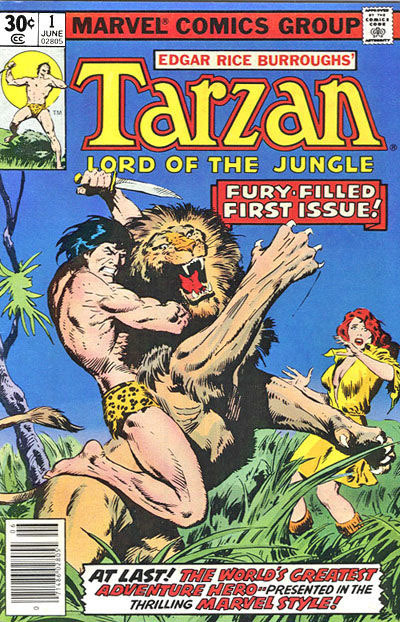 The logo continues the theme: TARZAN in the newspaper strip style but with even thinner serifs than the Marvel Version, and the subtitle in the same font used on the Ace paperback covers, a terrific idea. Really complements the design and has that nostalgic tie to Frank Frazetta. Dark Horse also produced the hardcover book edition of the same story, and here at last you finally get to see my favorite J. Allen St. John logo design (from the novel “Tarzan and the Golden Lion”) at a size where it can be seen and enjoyed. I guess it also appealed to Danton Burroughs of ERB, Inc., as I believe he had approval on this project. If you look back to the tiny reproduction of the “Golden Lion” cover in part 1 of this logo study, you’ll see the BY EDGAR RICE BURROUGHS is also the same as here. But there was apparently no useable copy of that element, plus they needed to add the co-author’s name in the same St. John style. Dark Horse contacted me, and I was delighted to do it for them, thus finally having at least a small part in the Tarzan logo story. And, for pure enjoyment, you can’t go wrong pulling out any of the Burroughs Tarzan novels and settling down for a good read! This entry was posted in Logo Studies on December 12, 2007 by Todd. Nice work on this Todd. I’d prefer to keep all my logo studies on my own site, but you’re welcome to link to it, as I’ve linked to your site. The official TARZAN logo that the Estate favors is the one that you see on some DC, Marvel and Dark Horse products — the one from the newspaper strip, the one that was elongated for the DC and Marvel covers. When I ran the E.R.B. comic book department, that was the one I was told to use. Gold Key could have used it but chose not to because they felt it would not fit in with their cover format. DC didn’t have to make any sort of special arrangement to be able to use it. It came with the character. They also, at least when I worked for E.R.B., encouraged its use on paperback covers but didn’t insist. What a great collection of entries! I’ve checked out your site before, but you’ve really come a long way here. You really came up with something exciting, interesting, and shows your depth of knowledge on the subject of typography. As a student of graphic design, I’m eating this up! !